“With enough determination, any bloody idiot can get up this hill” declared Rob Hall, the leader of a commercial expedition to Mount Everest, on May 6, 1996. Four days later the same “hill” claims the lives of eight men and women, including Rob Hall. 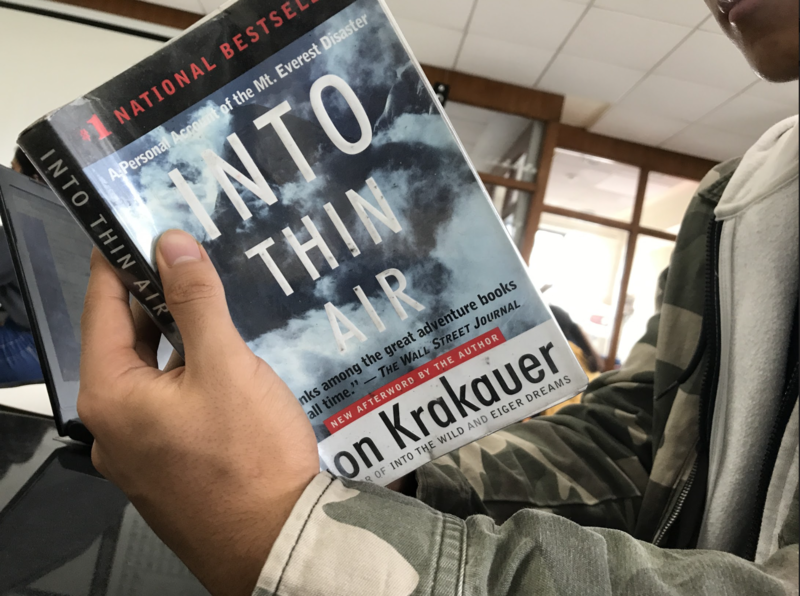 Into Thin Air: A Personal Account of the Mount Everest Disaster, by the American writer and mountaineer, Jon Krakauer, recounts and relives the storm that struck Krakauer and his team on May 10, 1996, while they were 29,028 feet above sea level. The hypnotic and compelling story roots back to February of 1996 when Outside Magazine assigned Krakauer to write an article on bulgerois commercialization of Everest by trekking up the Mountain alongside Rob Hall’s team. Many climbers were outraged by Everest “being sold to rich parvenus” who were neither skilled nor passionate but carried colossal egos that were greater than the mountain itself. This intricate relationship between money that the Government of Nepal earns from Everest and commercial expeditions has been highlighted throughout the book. Krakauer makes the readers consider the ethical dilemma that is faced by climbing Everest; on one side rests the childhood dream to be on top of the world and on the other is the impact that it has on Everest itself. As the novel continues in an eerily fashion Krakauer describes in colossal details the hypoxic struggle he faced while climbing Everest, while subtly plaiting in the stories of his team and the history of the great mountain. The book slowly begins to engrave the ferociousness storm and in great detail describe each heartbreaking deaths. Into Thin Air is a novel which questions the most fundamental aspect of humans and nature interaction. Not only does Krakauer portray the unrelenting reality of hopes to reach the summit deluding climbers of natures potential to murder, but he also makes us realize that humans are the source of their own destruction. Krakauer depicts the aftermath of the rapacious storm as even more stunning and tragic as he blames himself for the deaths of certain members due to his inability to help out in rescuing his teammates on the night of the storm. This dejection is amplified by the vivid description of the families of the deceased and backdrop of each character. Through this novel, Krakauer reinforces that the same perseverance that drives climbers to reach the pinnacle of the earth can also show them the death that stares from the other side.